Products and Services - AJ & J Furniture Inc.
AJ & J Furniture Inc.
is a Canadian based company that specializes in providing the highest quality seating, furniture and stained glass solutions to the religious and judicial markets in Canada and the Northwestern United States. 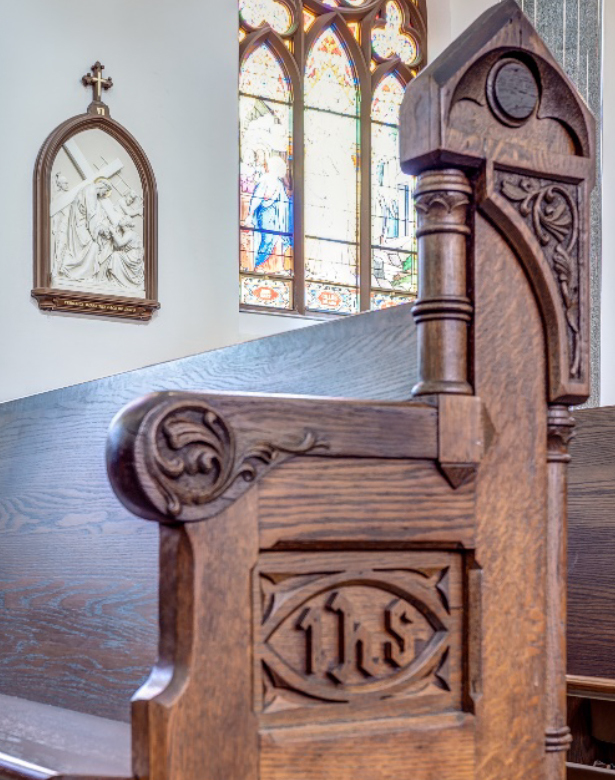 Premium supplier of Theatre Style Seating, Chairs, Pews and stunning custom Stained Glass designs. Contact us today and we will be happy to provide you with the information you need. You can also fill out our online questionnaire and we will get back to you promptly. “Church of Our Lady Immaculate, a Canadian National Historic Site and recently designated by The Vatican in Rome as Basilica of Our Lady Immaculate, underwent a six million dollar interior renovation in 2014. An important component of the renovation was to have all the original wood pews removed and restored off site. We chose to deal with New Holland Church Furniture, a company in the United States, and our point of contact was Andrew Gale their business development manager. We found Andrew to be very diligent and responsive to our needs. He stayed abreast of the various phases of the job and handled change orders in a timely manner. A main concern for the church was the ability to continue to celebrate mass on the weekends while the work progressed inside the church. We could accommodate 700 chairs for this purpose however they would need to be easily moved and suitable in appearance for a worship environment. Andrew made the perfect suggestion for a pew chair that fit these requirements. In fact, due to inclement weather the delivery of the chairs was delayed by one day which resulted in a few less volunteers available to offload them. As a testament to his character, Andrew came to the church the day of the delivery to help make up the difference in volunteers and assisted with the offloading. AJ & J Furniture isn’t about selling you something….anyone can do that. We really want to understand what you’re looking to accomplish with your seating. Whether you’re a church, a synagogue, a chapel or a funeral home, you’ve got unique goals and objectives. Once we understand what’s important to you and what you’re hoping to accomplish in your worship space, we can tailor a design solution specific to your goals as well as your budget. We’ll work with the architects, contractors and primary decision makers to ensure that your dreams become a reality. AJ & J Furniture offers a full complement of products and services designed specifically for courtrooms. Our solid wood seating solutions are of the highest quality. Our woods and veneers, our manufacturing methods, how we fasten, how we finish and how we deliver all contribute to our ability to provide the best pews and furniture products in the market today.